In this post, we look at some of the key differences between these models and how they stack up with other Datto solutions. What is the Datto SIRIS? Let’s start with a quick overview of the data-protection capabilities built into all Datto SIRIS models. SIRIS is a BDR appliance that allows for fast, resilient backups that can be restored and virtualized in minutes, from virtually anywhere. Image-based backups: Each backup is a fully constructed virtual machine that can be booted up almost instantly from the SIRIS device or from the Datto Cloud. 5-minute RPO: Datto’s patented Inverse Chain Technology eliminates the dependence on previous snapshots, allowing for more granular backups (as often as every five minutes), without having to reconstruct the backup. Fast, iron-clad recovery: The most commonly occurring problems in conventional backup chains are eliminated completely with Inverse Chain Technology, resulting in a more resilient backup and no surprises during recovery. Virtualize from anywhere: Backups can be virtualized with a few clicks, allowing nearly uninterrupted access to critical files and applications. Cloud replication: All protected data is replicated to the Datto Cloud; data is stored in at least two secure data centers for greater redundancy. End-to-end encryption: All data is encrypted (AES-256) as it’s in transit and as it resides in the cloud. Datto markets the SIRIS as “the first fully featured total data protection platform delivered in one integrated package.” We’ll dig into more of its innovative features below, but first, let’s look at some of the differences between the various Datto SIRIS models available. The SIRIS 3 is the latest-generation SIRIS, available in several models to fit the needs for both small, medium and large organizations. It’s Datto’s top-of-the-line BDR device, offering enterprise-level data protection at a value that makes sense for smaller businesses, too. The SIRIS 3 is designed to protect physical, virtual and cloud infrastructure running on Windows, Mac or Linux. With the fast recovery process and virtualization capabilities mentioned above, admins can spin up lost servers in a matter of seconds, without the need for additional tools. Architecturally speaking, the SIRIS 3 is an x64 Linux server, running on Ubuntu 16.04. The SIRIS 3 can also be deployed as Virtual and Imaged options, as we discuss below. Note: If the SIRIS 3 seems like “too much” for your continuity needs, check out the Datto ALTO 3. The ALTO 3 offers many of the same features as the SIRIS 3, but in a package that makes more sense for small businesses. The Virtual SIRIS appliance is similar in functionality to the SIRIS BDR appliance. Datto has marketed the virtual device as “the easiest way to protect your data, regardless of infrastructure.” It protects both virtual and physical environments and has local storage options ranging from 500GB to 60TB1. Virtual SIRIS supports virtual environments on VMware vSphere, Microsoft Hyper-V, and Citrix XenServer. One key difference between the SIRIS 3 and the Virtual SIRIS is that Virtual allows an administrator to run the device as a virtual guest. VMs can be spun up instantly from the Datto Cloud—including even your oldest “archived” recovered points. Or, they can be spun up directly on the local device, even in the absence of Internet connectivity. Virtual SIRIS models are denoted by SV in the model numbers, which range from SV1000 to SV60000. SIRIS Imaged is a fully featured SIRIS 3 software appliance that is deployed on your existing hardware. 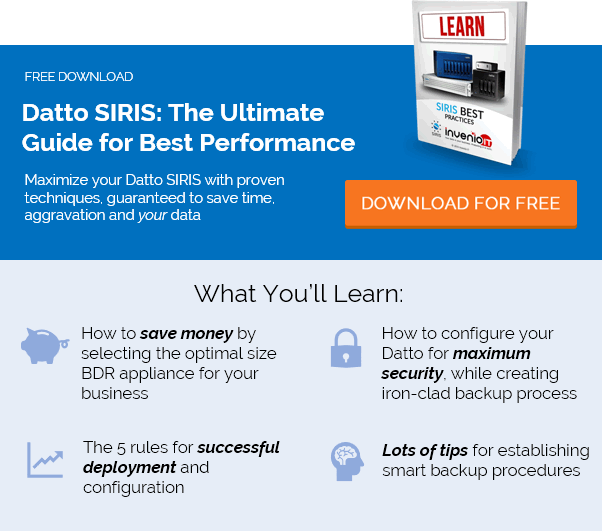 With SIRIS Imaged, Datto lets you repurpose existing BDR appliances or other hardware into a fully functional SIRIS 3 device. Simply insert and boot the USB drive and voila! You’ve got all the functionality of Datto SIRIS within your current hardware. After booting the USB drive, you simply follow the on-screen instructions to complete the SIRIS 3 image and start protecting your infrastructure immediately. The Datto SIRIS X Series takes everything that’s great about the SIRIS 3 and puts it in an all-Flash storage device for even greater speed. These devices are literally redefining the industry’s performance standards by incorporating blazingly fast solid-state drives (SSD). Datto says that speeds are unrivaled in the industry, and we don’t doubt it. Faster drives translate into faster backups, faster recoveries and seamless virtualizations that let you run your critical applications without a loss in performance. All SIRIS X devices offer the full functionality of the SIRIS 3. But instead of using traditional, spinning hard disk drives, the X series stores data on chips. That means no moving parts, which are inherently prone to mechanical failure over time. Each version has 16GB of RAM and an Intel Core i3 processor. Two form factors are available: the compact desktop version and the Professional 1U Rackmount version, which offers even greater SSD storage capacities of 4, 8 and 12TB. If you want to take a stroll down memory lane, you can still access a wealth of information online on the SIRIS 3’s predecessor: the SIRIS 2 (and even the original SIRIS). On a fundamental level, the Datto SIRIS 2 offers much of the same functionality as the SIRIS 3 does today, minus some of the features and power. The SIRIS 2 was Datto’s flagship up until June 2016, when the company announced the SIRIS 3. The SIRIS 2 offered storage capacities of 500GB to 60TB, depending on the model (Business, Professional, Enterprise). Some of the original models included the S250, S500 and S100, with storage capacities of up to 2TB. You can find some specs here. We’ve barely touched on the numerous features that make the Datto SIRIS the preferred business continuity solution for thousands of organizations around the globe. Automatic backup testing: Datto’s Advanced Screenshot Verification checks that a backup is viable by taking automatic screenshots and test-booting protected servers. Ransomware protection: All SIRIS devices now feature built-in ransomware detection, alerting admins to the very first signs of infection, so that backups can be restored with little to no disruption. Hybrid virtualization: Available on all SIRIS devices, hybrid virtualization improves fault tolerance and reduces reliance on bandwidth by allowing you to boot a virtualized node in Datto’s cloud and then manage it with local hardware. Greater insight into data changes: In addition to full-scale recoveries, Datto’s Backup Insights platform makes it easy to restore individual files and folders. Even without access to file names or dates, you can quickly identify which files have been deleted, modified or created between two backups. Get to know the Datto SIRIS by requesting a free demo from Invenio IT. Our business continuity experts are happy to go over your options and answer any questions you have. Contact us today at (646) 395-1170 or [email protected].